Welcome to Sagada, you can immediately start to cave exploration Sumaging which is the largest cave in Sagada. Sagada is lower than Bontoc, Sagada so the air is hotter than in Bontoc. The heat of the sun will be stung during the day, if this is your first time coming to Sagada, you are advised to buy travel maps for sale at a price of 20 pesos. These maps can be purchased at a store near Tourist Information Center. This map is quite easy to understand because Sagada only consist of a small village. There are several attractions that can be enjoyed here. Like Sugong Hanging Coffins, Rice Terraces, Hanging Coffins of Echo Valley, Lumiang Burial Cave, and also the most famous Cave Sumaging. The cave can be reached from a TIC Sumaging foot for approximately 40 minutes. Before getting to the cave Sumaging, you will see a wooden box that hangs on slope. The place is named as Sugong Hanging Coffins. Sugong Hanging Coffins coffins hanging on the cliff rocks, which may have been hundreds of years old. the path to the cave is quite steep, cave mouth wide enough and quiet. To explore all the caves need the help of tools and adequate lighting. Often found in the cave of the coffins were stacked wood. 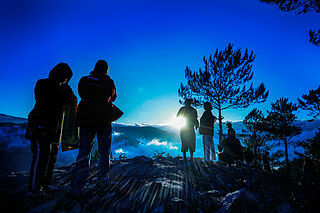 Sagada is one of the cultural destinations in the Philippines. Sagada has a tradition of putting a coffin in a cave or hung on a rock cliff, this tradition has begun to be abandoned by residents in Sagada. If you want to see the traditional activities that are similar to those in Sagada, you can visit Tanah Toraja which is located in South Sulawesi, Indonesia. There you can join with tourists and local residents to celebrate the funeral at the top of the cliff. This tradition still continues today in Tanah Toraja. Sagada tradition has been going on since two thousand years ago and now has a majority of the population is Catholic Sagada so that this tradition began slowly vanished over time. The last time there was the addition of coffins hanging on the rocks is in June 2008. As well as the traditional burial the bodies in the past, Sagada is often referred to as a producer of marijuana. Although not sold legally, the issues surrounding marijuana continues to grow among tourists who want to visit there.